Before you build the project here check out my book: Sound Card Oscilloscope - Build Better Electronic Projects. It contains a slightly better circuit for the probe plus additional circuitry for calibration and a signal generator. 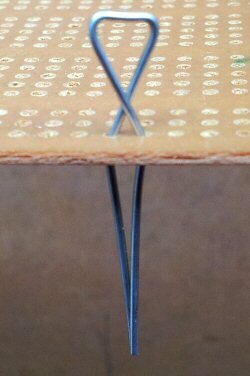 This is a very simple circuit that can easily be built on a small piece of perforated matrix board. I used a piece of board that had no copper at all but you can use one that has isolated copper pads around each hole just as easily. The way that you build your probe will depend on what type of potentiometer you decide to use. I had some large trimmer variable resistors in amongst my junk but you can use any type of trimpot or panel mount controls just as easily. Each of the two channel circuits are identical and can be built on the same board next to each other as in the picture. Input and output cables should be attached to wire posts on the edge of the board for convenience. You can buy proper posts that fit into the holes in perforated board if you want to. I have some of these test point posts and frankly I think that they are more trouble than they are worth. I would rather make my own and this is how you do it. 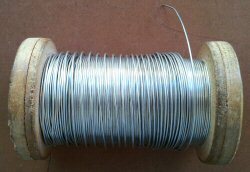 I used 22 SWG (21 AWG) wire from a reel that I have had for some time but you can strip the insulation from solid connecting wire if that's all you have. 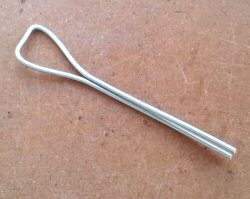 Cut a length of wire approximately 70mm (2.75inch) and hold it in your Long nose pliers roughly half way down the nose. 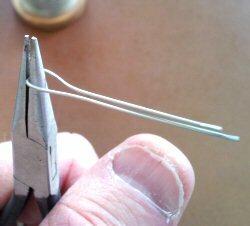 The width of the pliers at this point will determine the size of the loop at the top of the post. 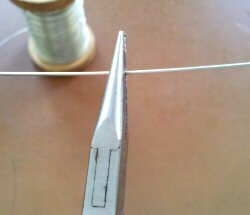 Gently bend the wire around the pliers to form a loop at the top with the 2 ends of the wire making the post. This is what the finished post should look like. With practice you can make these very quickly and you can vary the length and the size and shape of the loop at the top to suit your needs. You may find that it is a tight fit getting the double width wire post through the holes in the board. 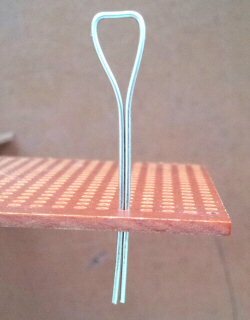 I managed it by squeezing the wire together in a pair of pliers. You can also enlarge the hole slightly by running a small drill through it. The holes in some boards may be larger than others. If this post doesn't work for you then try the alternative method below. 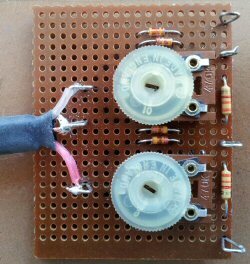 If you have trouble feeding two wires through one hole then you could try this alternative post that uses 2 holes in the board but avoids having to enlarge holes. Insert the alternative post into 2 adjacent holes and bend to secure.